Chives flower in quite large and beautiful patches in places. Scientists believe that this is one of our earliest plants, arriving shortly after the land became free from ice. It can stand the rough weather in coastal areas without snow cover, drought doesn’t destroy it, it appreciates calcareous soil, grows lusher with nitrogen. 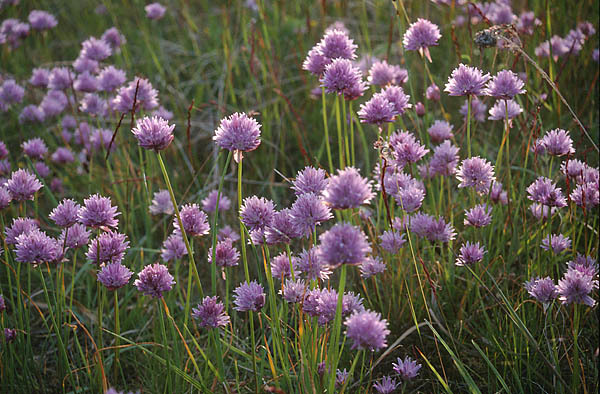 So-called bird isles have impressive stands of chives. Inland plants may originate from Iron Age settlements: people did not have any other sources of vitamins than from nature. Chives were probably gathered and grown as a medical herb and vitamin source.